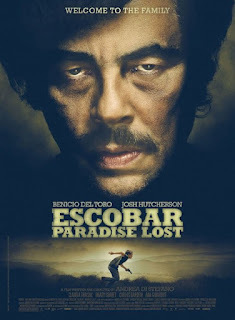 Despite having his name in the title, infamous Columbian drug lord Pablo Escobar is not the main character in ESCOBAR: PARADISE LOST. That honor belongs to naïve Canadian surfer dude Nick Brady (Josh Hutcherson). We first meet Nick in 1991 as Escobar (Benecio del Toro) is about to turn himself over to the authorities. We don’t yet know how this clearly in over his head gringo became a part of Escobar’s organization; we only know that he is being asked to help Escobar hide his income before his sentence begins, and that doing so will require Nick to commit murder. Cue the flashback. According to the onscreen text, Nick arrived in Columbia “a few years earlier”. Nick, his brother, and his brother’s wife all seem to think that eighties Columbia is the perfect place to live a beach bum existence, raise a family, and open a restaurant/surf shop in the jungle adjacent to the beach, seemingly without checking with anyone in the pretty seaside village about licensing or possible objections from local thugs. As it turns out, said local thugs are not pleased with these hippies moving in to their territory without notice. Luckily Nick falls hooks up with Maria (Claudia Traisac), who just so happens to be Pablo Escobar’s niece. That takes care of the thug problem, albeit in a rather violent and permanent matter, but soon creates a whole world of other problems for Nick. Nick tries to turn a blind eye to just how scary Maria’s “Uncle Pablo” really is, which isn’t that hard to do for those in his inner circle of family. At least as the film presents him, Escobar fancies himself a do-gooder merely looking to protect his kin, as well as a devout Catholic who, at one point while praying with his mother, offers his hopes that God will understand why he had to do some of the bad things he did. But when things get really bad for Pablo, not even family is safe as he eliminates anyone he perceives as a threat. Nick realizes he and Maria need to get away, but it may be too late. Hutcherson is convincingly out to sea, but it’s unclear what we’re really supposed to take away from Nick’s character arc other than it’s a bad idea to get involved with someone whose uncle is a murderous international drug dealer. Traisac is pretty and vibrant as Maria, but like so many movie girlfriends isn’t a character so much as a plot device necessary to draw Nick into the sphere of Pablo’s seamy underworld. And despite his limited screen time, del Toro still makes his Escobar a memorable and compelling figure. The idea of seeing Escobar through the eyes of an outsider has potential, but writer/director Andrea Di Stefano’s script ultimately doesn’t have much to show us from any perspective that we haven’t seen in other “rise and fall of a drug kingpin” movies. The film spends as much if not more time on the love story between Nick and Maria, but their relationship still feels rushed and banal. Ultimately it’s a well made but somewhat schizophrenic film that tries to be a bit of a historical drama, a bit of a romance, and a bit of an action movie/thriller, and falls short on all three counts. 2 out of 4 stars.